Not sure who out there in webworld made this, but we sure think it's pretty damn funny. Kudos to whoever did this. Now, just in case, we're not posting this image to make any political statement (we do not subscribe to the standard school of Bushbashing), except to say that all politicians have always messed things up, and this may explain why. I can hear it now: "What should we do about that Foreign Policy?" 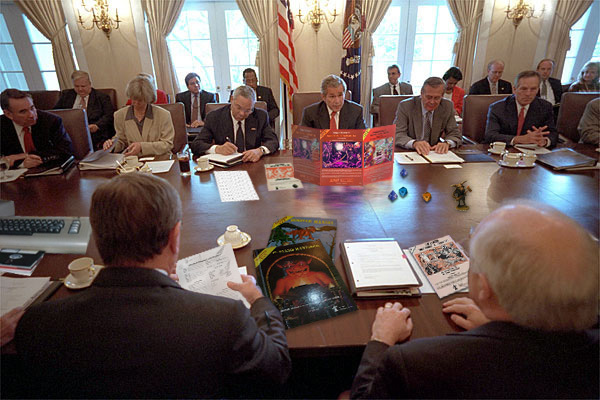 "I dunno, just roll D6 and reference the chart". These are the late night designs of Matt deMille. Hope you find them as funny as he did. If you don't, or worse, you want to sue us, um, how about emailing us first, and kindly informing us that we've crossed some legal line and that we should just take the pictures down? We'd be more than happy to do so. 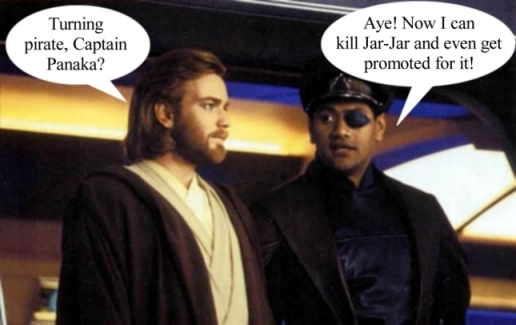 Captain Solo. Click on the pic for a larger image. Captain Panaka. Click on the pic for a larger image. 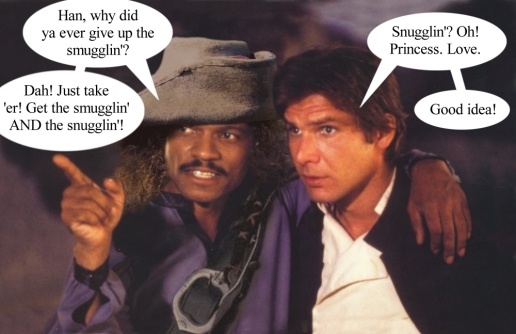 Captain Lando. Click on the pic for a larger image. 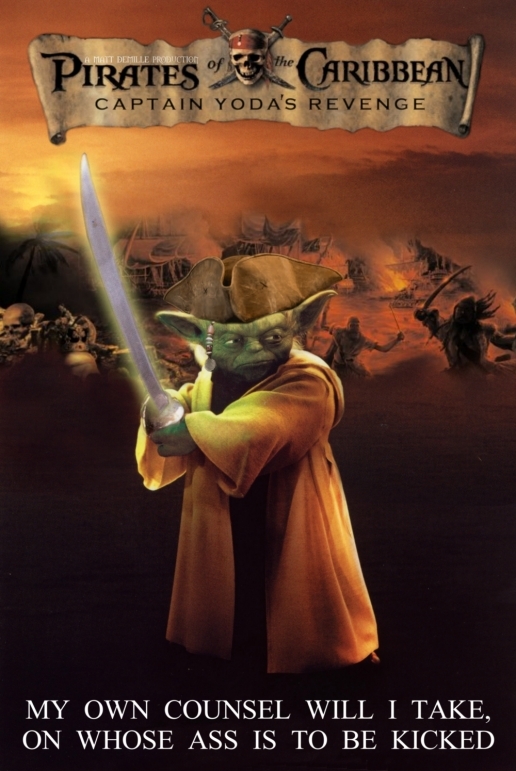 Captain Yoda. Click on the pic for a larger image. 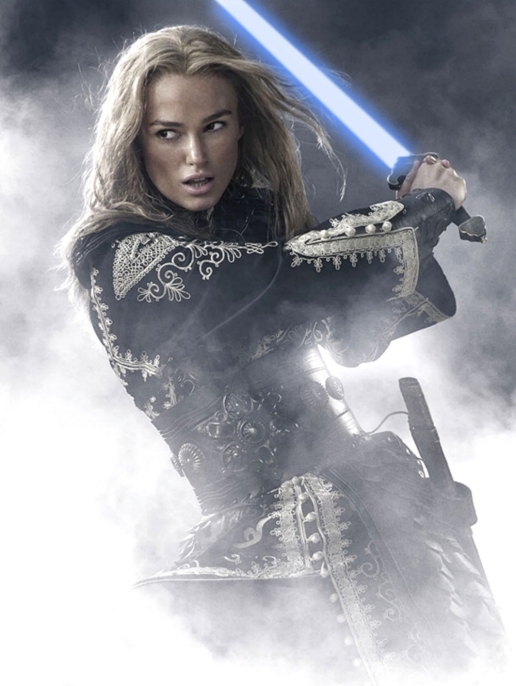 I think Mrs. Turner would have done much better for herself if she had carried around a lightsaber instead of a Will Turner. What do you think? Click on the pic for a larger image. 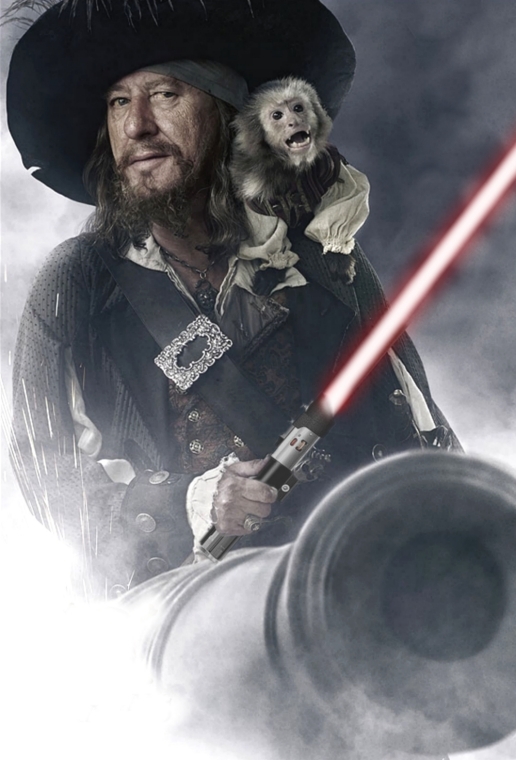 Captain Barbossa has just a bit more Cool than he really needs. But all the more power to him! Click on the pic for a larger image. 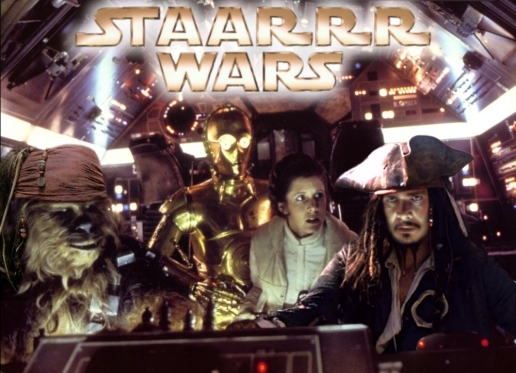 Now this is a movie I would certainly pay to see . . . Click on the pic for a larger image. Think my latest midnight oil art would offend anyone, or inspire them? Well, it's parody, it's humor, it's laughs, so let's get on with it! 20th Century Fox logo . . .
Lucasfilm logo . . .
"Not so long ago, in a land not so far away . . ."
"Star Wars: Episode VII: Passion of the Jedi" . . . The true story of Jesus at last! He finds a lightsaber and starts cutting down Romans. He's inspired by the Star Wars Saga and sees the Romans as, well, the Empire! "Star Wars: Episode VIII: The Romans Strike Back" . 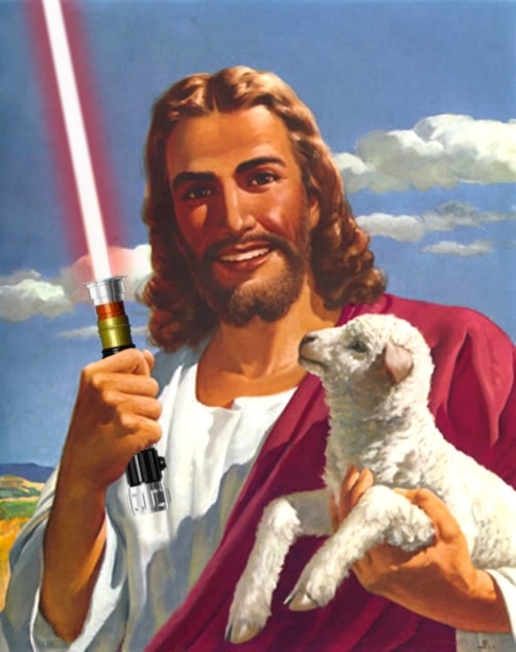 . . Jesus goes about restarting the Jedi order, on Earth, all the while battling Romans with his lightsaber. "Star Wars: Episode IX: Revelations of the Jedi" . . . Betrayed by one of his new apprentices, who sells out Jesus for 30 silver, this traitor uses it to buy his own lightsaber, and the duel is on. Ultimately, Jesus gets his hand cut off, and they crucify him, nailed accurately through the wrist but accidentily (he doesn't have a hand to nail through), but due to his Passion he does not give in to the Dark Side. In the end, Fozzy Bear shows up, and choosing between the Grail and the lightsaber, he takes both, cuts down Longenis, and then attacks the camera crew. The credits roll as we hear Fozzy Bear's maniacal laugh echoing in the darkness of the theater. With the Grail's powers, Fozzy can live until the 1970s. And, most terrifying of all, he could still be around . . .
Well, I'D pay to see it . . .